World-leading experts on dementia assembled at the Melbourne Convention and Exhibition Centre in October for the 17th Dementia Australia Biennial National Dementia Conference. They were joined by more than 700 delegates, who were encouraged to ‘Be the Change’ in improving the quality of life and care of people impacted by dementia. Dr Gandy was joined by Naomi Feil, pioneer of the world-renowned Validation method, who gave a presentation on how to apply Validation techniques to people living with dementia at times where others may have difficulty understanding these challenging expressions of unmet need and/or symptoms of dementia. The conference was officially opened by Dementia Advocate Christine Bryden, who was diagnosed with dementia in 1996, at the age of 46. 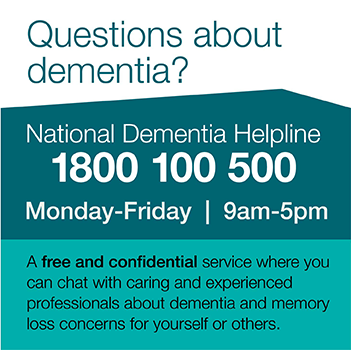 Christine was joined on the program by South Australian of the Year 2017 Kate Swaffer, who was diagnosed with dementia in 2008 at the age of 49. The varied program featured five keynote presentations and 10 concurrent sessions from people living with dementia and their care partners, with other speakers ranging from researchers and medics, to health care professionals and academics. The conference also incorporated the impressive Feed Your Senses space, which showcased a dementia-friendly garden and cutting-edge technology designed to enhance the lives of people impacted by dementia. Dementia Australia CEO Maree McCabe said the conference provided delegates with a unique opportunity to explore leading approaches from across the globe that support people living with dementia and to improve the quality of life and care of people impacted by dementia. “It was so exciting to welcome such an eclectic and respected range of leading experts from around the world to Melbourne. 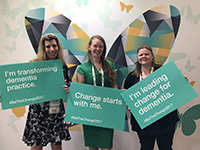 I have no doubt that attendees from the sector and community will have come away feeling energised and inspired to implement their learnings, and to continue making a difference to the lives of people living with dementia,” Ms McCabe said.